Welcome to Crock pot Thursdays by Andersons Angels and The More The Merrier. This is a blog hop for and about delicious Crock Pot Recipes! We are hoping that this hop will help all you busy moms with getting yummy dinners on the table for your families without having to spend a ton of time in the kitchen. 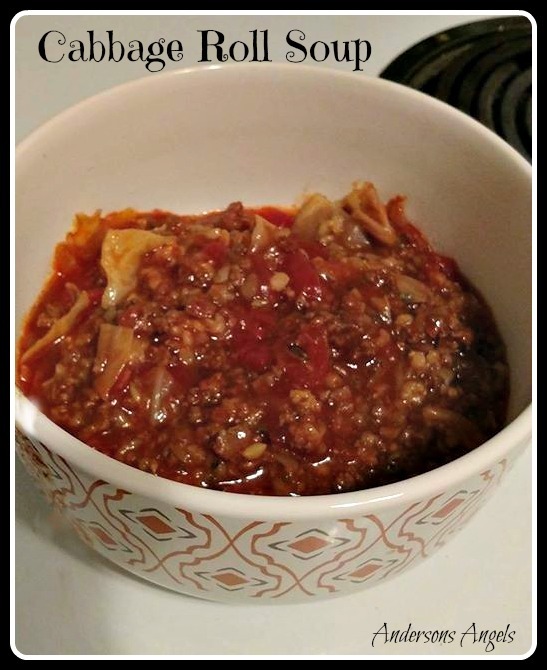 This week I am sharing with you my recipe for my Cabbage Roll Soup. Cook your hamburger along with the onion and garlic until cooked through. Drain off the grease. While meat is cooking chop up the cabbage and place in your crockpot. Once meat is cooked and drained add the remaining ingredients into the meat and simmer for 5 minutes. Then pour the mixture on top of your cabbage.